See some of the island’s most astounding features up close and personal at Hawaii Volcanoes National Park! We recommend approaching from Highway 11 before continuing to Mauna Loa Road for spectacular views at 9,000 ft. There are many hiking trails along the way, including Bird Park and a few lava tree formations you can look at. On the way down you can venture into the Park itself, first by stopping at the Visitor Center. Next to it, you’ll find Volcano Art Center, a collection of works from local artists. The next place to visit is Jagger Museum, where you’ll find more details on how eruptions are formed. Some of the results, such as Pele’s tears—droplets of solidified lava—are also on display. Here you can get a great view into the mother crater herself, from the top of the museum. It’s the perfect place to take some unforgettable shots of Kilauea. If that’s not enough, then you can also take a drive along the Crater Rim and on to Thurston Lava Tube for a short hike through an actual lava tube in the rainforest. As evening gives way to night, take the drive back up the mountain back to the village and enjoy a nice dinner at Kilauea Lodge. Head south through the National Park and along the coast to South Point, which is also known as Kalae. Although the area appears desolate, its breathtaking cliffside views are stunningly beautiful. Walk the eastern coastline and explore what the seashore has to offer, or—for those who love to wander off—you can hike or four-wheel to Green Sands Beach, one of only four of its kind in the world. The ocean here is too treacherous for swimming, but it’s definitely worth seeing at least once in your life. Once you have absorbed all that South Point has to offer, turn around and head back to the little town of Na’alehu, where you will find a cute little country eatery called Hana Hou for lunch. Right across the street you can stop at Punalu’u Bakery for a sample of their deserts or assortment of sweetbread. From there, take a drive to Punalu’u Black Sand Beach and if you are lucky you might be able to see Green Sand Turtles basking in the sun along the shore. After entering National Park boundaries once again look for a left on Pi’i Mauna Drive and a hidden treasure: Volcano Winery. Stop in for a sample, pick up a bottle or two, or even get a few souvenirs before heading over the mountain to 2400 Fahrenheit, a glass art studio on Highway 11. At the end of the day, dinner at Thai Thai Restaurant is a nice way to bring the day to a close. Head east for our next choice: a scenic tour with a company called “Caverns of Fire”. They offer easy scenic walks of 1 to 1 ½ hours long, or 3-hour adventures that are physically more challenging. Those not into physical challenges can visit Hilo Coffee Mill to see how local coffee is processed and enjoy samples at the tasting bar. They have some nice blends you are sure to enjoy! Afterwards, visit the little town of Pahoa, for a few shops to peruse and eateries to sample. Then it’s off to the Lava Tree State Park: bring your camera for pictures of these tree formations. You might want to see if Puna Geothermal is offering tours of their operations along the way! You can while away the rest of a pleasant afternoon enjoying a nice picnic lunch at Kapoho Tide Pools or Ahalanui Hot Ponds, before taking a cruise through Red Road back up the mountain. Stop at Mauna Loa Macadamia Nut Farm and Panaewa Rainforest Zoo before venturing to the coastline for a stroll through Liliuokalani Gardens and Coconut Island. Then it’s on to Hilo and Richardson’s Beach Park to see what’s happening with the locals. For those who like museums, there are several to choose from here. First, there’s Imiloa Astronomy Center, which has a planetarium and inter-active displays that are great for kids. Then there’s Lyman Museum, and the Pacific Tsunami Museum. If you love hiking, check out Kaumana Caves, where American Jungle was recently filmed. Or, the Boiling Pots trail leads up Wailuku River. Both of these offer some great photography spots! Anyone up for a simple cruise could walk along Bay Front (known as Downtown Hilo), where you’ll find the Farmer’s Market in full swing on Wednesdays & Saturdays. Down along the first row of buildings you’ll find Mokupapa Discovery Center, which offers insight into the natural culture and history of the northwestern Hawaiian Islands..
There’s two other quick stops that you can make along the Bay Front: Wailoa Center & King Kamehameha’s Statue to take a few photos or see what is on display at the center. Local artists always have something going on there! Right outside Downtown on the northern side is the popular Honoli’i Beach Park, where local surfers like to gather whenever the surf is up. Then you can continue down the coastline and take the Onomea Scenic Route, which leads to Hawaii Tropical Botanical Gardens or Umauma Falls. Both are worth seeing. Before heading north today, load up on snacks, drinks, and items for a picnic. First, visit Akaka Falls along the Hamakua Coast. There are two incredible falls here: the 100-foot Kaluna Falls, and Akaka Falls, a 442 foot free falling waterfall. Be sure to bring your camera on this trek! After exploring Akaka Falls, journey to the little town of Honoka’a, stopping at Tex Drive In along the way. Known for their jelly filled malasadas, this restaurant is well worth a visit! 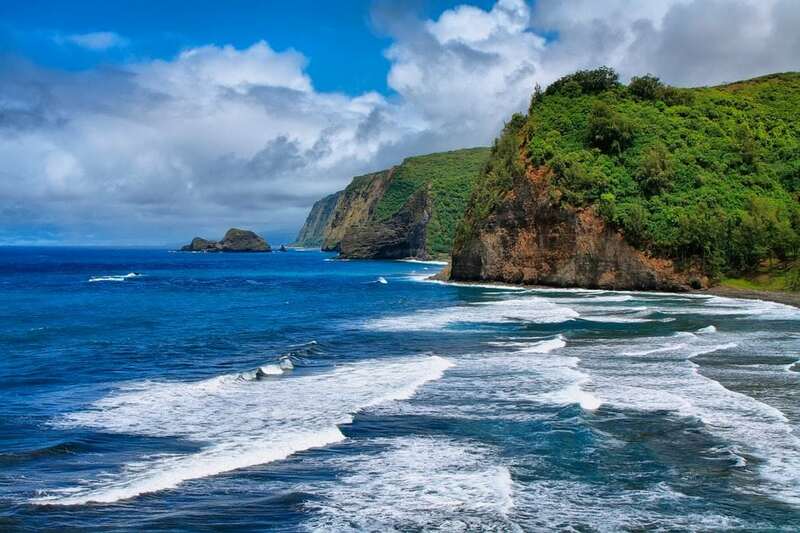 Then it’s time to travel along to the end of the road to Waipio Valley for gorgeous views of the Kohala coastline and black sand beach at the bottom of the valley. If you decide not to travel down the valley (which requires a four-wheel drive vehicle), travel on to Kamuela, also known as Waimea, home to Parker Ranch and the original Hawaiian cowboys. Take a stroll through the town and visit their local museum. Or, after lunch, you can keep heading north to the little town of Kohala, where you can see scenic points like Pololu Valley. This shows the coast line from Kohala back toward Waipio Valley. You can visit the little shops here and take a few snap shots of King Kamehameha’s Statue. Heading south instead leads to Hapuna White Sand Beach for an afternoon of swimming and basking in the sunshine. You could even take up a round of golf at one of the many courses along the Kohala Coast. Either way, we’re sure you will find exploring the Kona side of the island as adventurous as the Hilo side. Enjoy your stay in Hawaii!